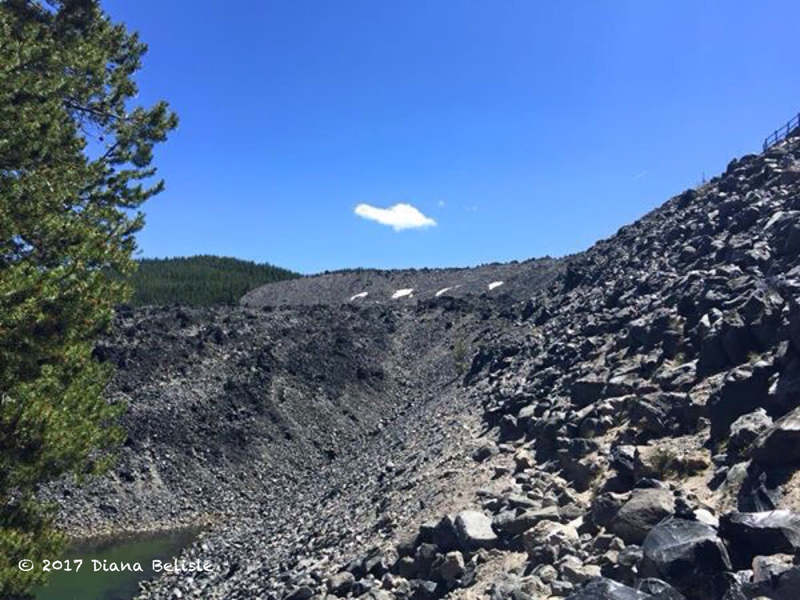 On Monday, July 10, we took a day trip southwest of Prineville to Newberry National Volcanic Monument. 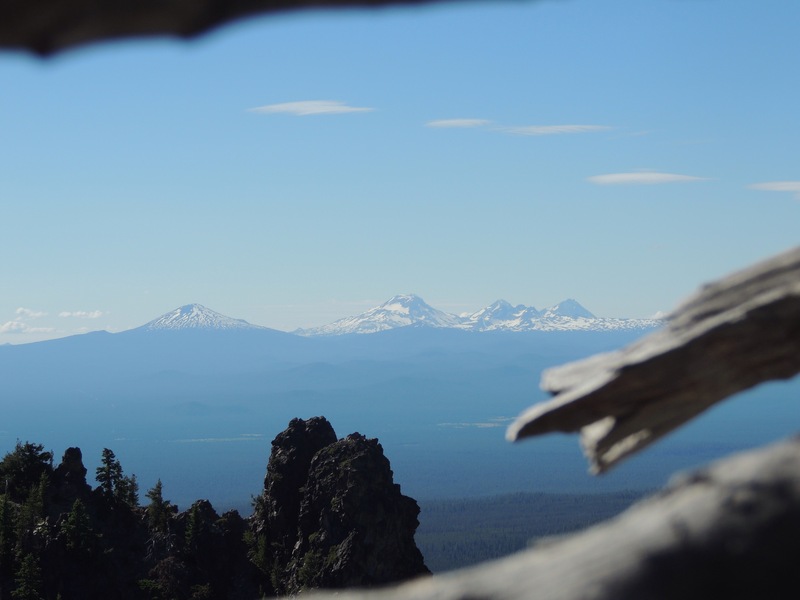 At 1200 square miles, Newberry is the largest volcano in Oregon. It is unusual in the fact that it sits east of the line of peaks that make up the Cascade Mountains, although it is very much a part of that chain. 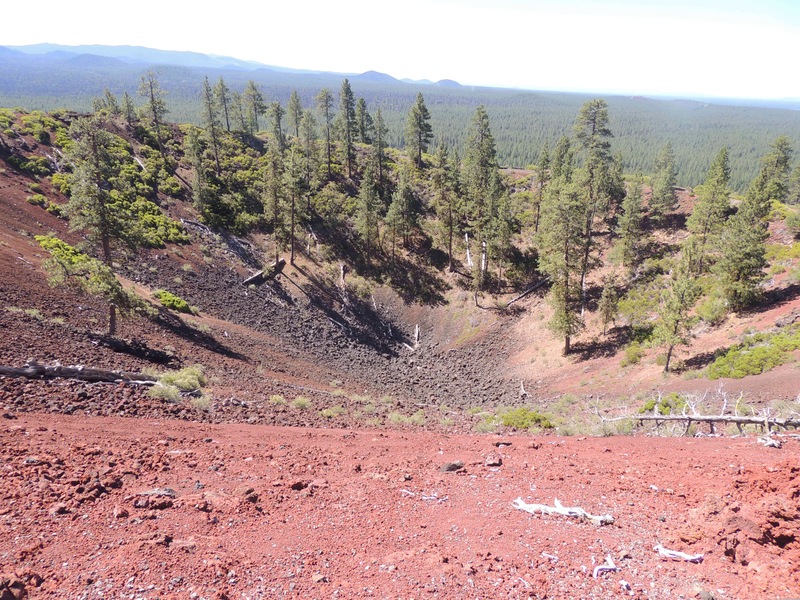 Newberry Volcano is considered active, and with its proximity to the growing towns of Central Oregon, it is constantly monitored for geological changes. Where most of the volcanos in the region are made up of one dominant mountain, this one is unique in the fact that it has over 400 smaller cones scattered around its main crater. The main peak collapsed into its magma chamber, similar to what Mt Mazama (now Crater Lake) did. Although both craters now contain bodies of water, they are very different from each other. Newberry’s lakes are much shallower and are separated by a volcanic cone and rock that completely span the larger crater. The national monument encompasses 54,000 acres and is administered by the U.S. Forest Service. Since this was a day trip, it would have been a rush to hit every feature of this park. 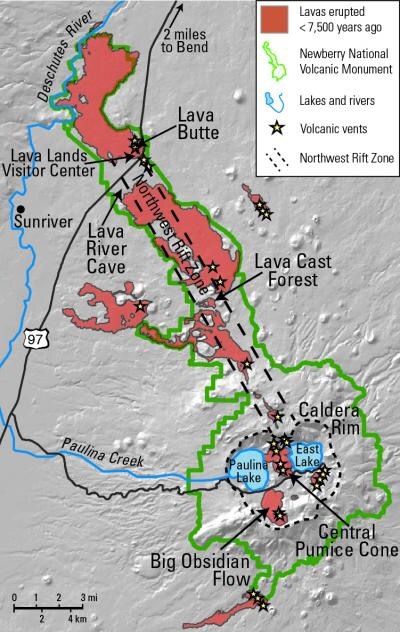 We opted to skip Lava Cast Forest and the Lava River Cave on this visit, hoping to catch them later in the summer. This allowed us to spend quality time at the other points of interest. Our first stop was at Lava Butte. This is a photo looking into the crater. 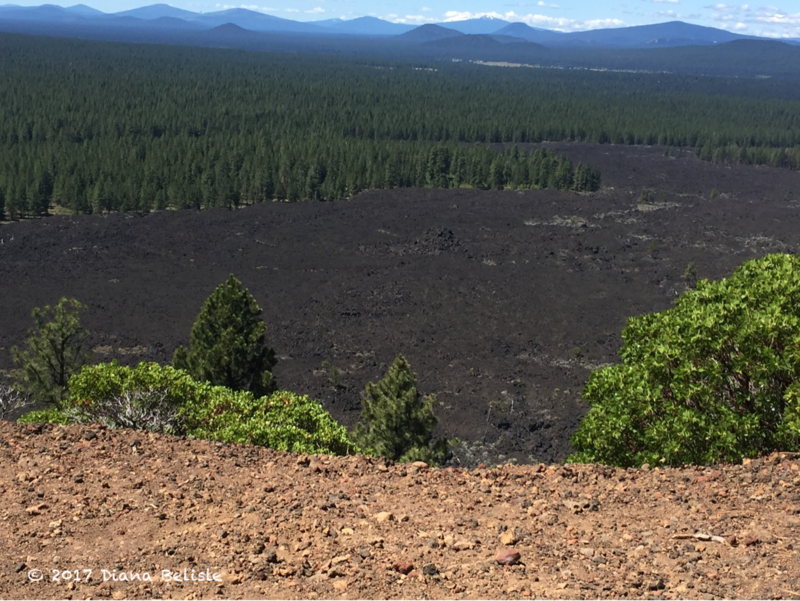 Lava Butte is a fairly symmetrical cinder cone that sits out on somewhat of a flat plain. It erupted only once around 7000 years ago, spewing lava to the west. That lava field remains free of vegetation, which really gives a clear view of the footprint of this small volcano. Towards the end of the eruption, cinders built up around the vent and formed the 500 foot tall butte we see today. 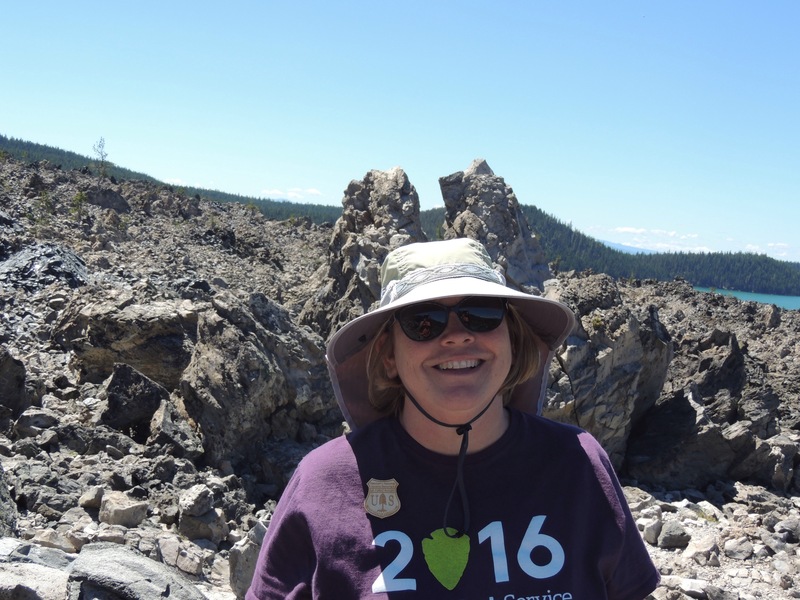 The next spot we visited was the Big Obsidian Flow. Talk about awesome! 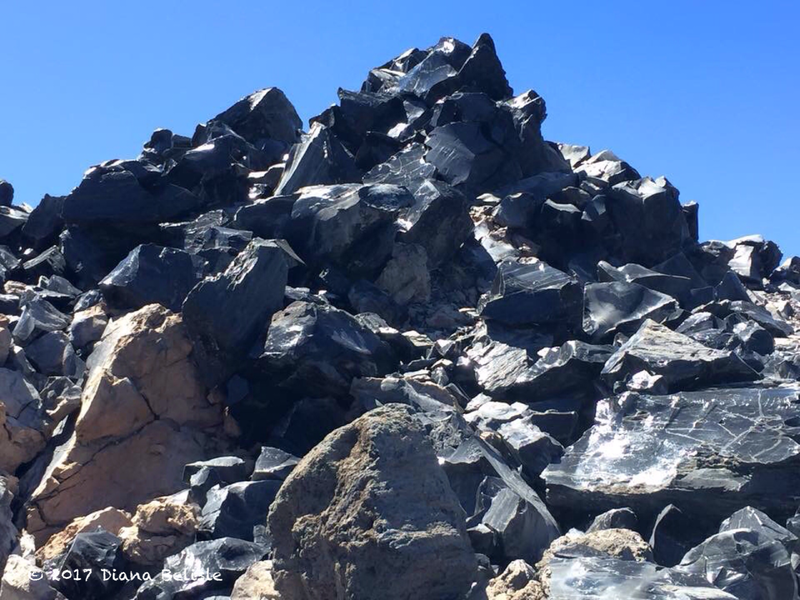 This is a giant wall of black glass that oozed from Newberry Volcano just 1300 years ago. We climbed the trail that ascends to the top of this geological wonder, being careful not to fall…as it would surely result in sliced skin! The hillside glistened in the afternoon sun. Absolutely beautiful! Here’s my sweetie with her Junior Ranger badge and obsidian ears! While we were in that area, we checked out the two lakes in the caldera. They were both very pretty with plenty of trees surrounding them. Lots of people boating, fishing and swimming. The last place we visited was Paulina Peak. 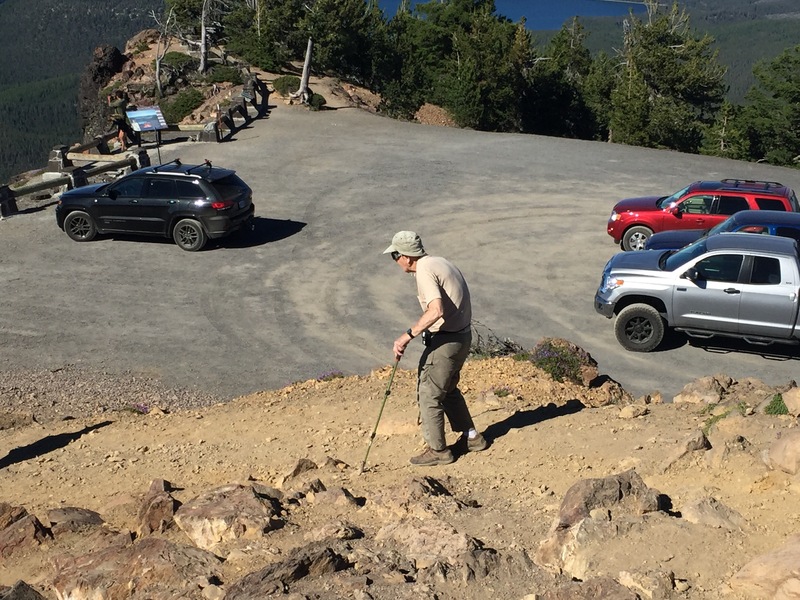 Named after Chief Paulina, the fierce Paiute warrior who defended these lands from settler encroachment, the 7940 foot mountain is the highest remaining point of the Newberry Volcano. From the top, we had a 360 degree view of the area. To the west, we could see everything in the Cascades from Crater Lake up to Mt. Adams in Washington. To the east, we could see Idaho and Nevada. Now that’s exploring vistas! While we were there, we spoke with this elderly gentleman. We really enjoyed our day at Newberry National Volcanic Monument. If you ever are near Bend, Oregon, be sure to check it out! I hope you get to come back and visit when you have a few days. The hike around Paulina Lake is spectacular. The Lava Cast Trail is short and sweet, and the cast are so cool. To think how long ago they were created! We couldn’t get up through the Big Obsidian Flow and the summit to look down on the lakes because of snow. So we are returning at the end of August to finish hiking all the higher elevations we could get to earlier. Glad you got to make a day trip to see the NM. Thanks for the lake recommendation, Pam! We will add that to the list! Yes, do put the lake on your list. It is about seven miles if I remember correctly, but other than a little up hill to get around a rock wall, the trail is right next to the water with different views in each direction and flat. The water is such a gorgeous color. That sounds like a great place to stop Jim. I would be fascinated to see the obsidian in place. What an awesome day! Great pics! Thanks, Kelly! It was really fun! Newberry is a great NM. I really enjoyed the obsidian flow. It was ridiculously huge, Gaelyn! We passed by there on our way from crater lake and saw stairs winding up what looked like a volcano cone. Was that part of the park?? Yes, but that was most likely a road around Lava Butte. They have a Shuttle that runs up it.